The most updated statistic shows that around 27% of the WEB (as of the end of 2016) are powered by WordPress with over 500 sites being created daily. More than 770 million posts were published on WordPress last year (that’s 24 blog posts per second!). 47000 plugins are offered by WordPress, and among the most popular ones – tools, which help WordPress sites to be search-engine friendly: Yoast SEO and All in One SEO Pack. 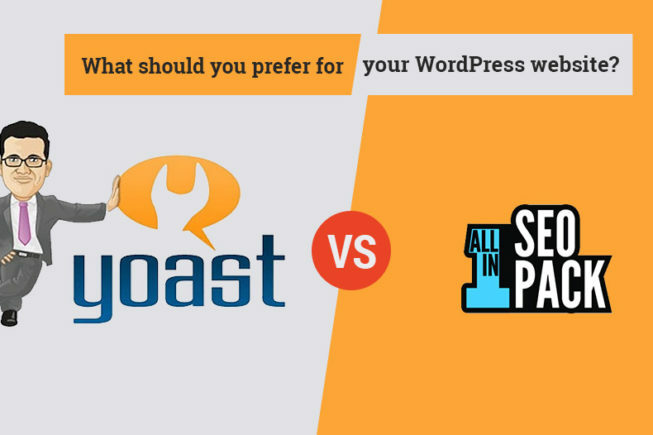 Both of them are very popular, and evenly matched, so sooner or later each WordPress user is going to face a question: which one to choose. To help you with your decision we will look into the features of both WordPress SEO plugins in a short review below. You are offered a quick tour through settings after activation to help with basic setup. The setting section is divided into several pages with five different tabs that divide all options by category. There you can do changes about information your site will share to search engines, and how it is provided. The tour explains a lot, but if you need more clarification on-screen help with short screencast videos is available. Using this plugin most users won’t have to change much, and even if they do, the plugin makes it easy for people at any level of knowledge to start optimizing their site. After activation of this plugin you will see a new item on WP dashboard. Click on it, and you will be taking to the settings page. Unlike Yoast SEO, All in One SEO Pack has all its settings on one single page. Even though it might look overwhelming at first, many find it very convenient to do all configurations on one screen without changing different menus. Non index setting for excluding content from being indexed. Every option comes with its own help icon. Menu also contents links to the support section with documentation, support forums, and video tutorials. Yoast undeniable is one of the (if not THE) best content analysis tools available on the market. You can find Yoast’s content analyzer in a meta box directly below the WordPress text editor. The first important feature – Snippet Editor which allows you to preview (and edit) how your content appears in SERPs. It gives you opportunity to customize SEO title and rewrite meta description. Next – Content Analysis Tool. To use it you need to input your focus keyword, and let Yoast SEO to analyze your content against 12 SEO “best practices”. Each practice analyzed using ‘traffic light ‘ scoring system – obviously, the aim is green. All in One SEO Pack features an SEO meta box, displayed directly below the WordPress text editor. From here, you can write an SEO title and meta description for your post, and All in One SEO Pack will render how your snippet might appear in the search engines. This is very much in line with what you get with Yoast. Most notably, however, All in One SEO Pack is missing a content analysis tool —Yoast’s most recognizable and popular feature. However, with All in One, you’re able to configure a custom canonical URL, ask search engines to no index/no follow the post, and also exclude it from your sitemap. This means you have greater control of the technical details. Another useful feature: All in One lets you edit SEO titles and meta descriptions in bulk from the All Posts screen..
Yoast SEO comes with some useful social media features. For a start, you can tell Google the URLs of eight popular social networks by navigating to SEO >Social. By switching between tabs, you can also integrate your website with four popular social media tools: Facebook Open Graph, Twitter Cards, Pinterest Open Graph, and Google+ Publisher verification. You’ll find social media features in the content analysis meta box, too. Scroll below the WordPress text editor, then flick across to the Social tab. Here, you can tailor the way your content appears on the social channels — you can edit the title, write a meta description, and also upload a custom image. There are separate tabs for Facebook and Twitter. All in One SEO takes a modular approach, so you can quickly disable any unwanted features. Social Meta is one of these modules, and can be activated via All in One SEO > Feature Manager. Once it’s activated, you’ll see a new Social Meta menu item, which is where your social media settings are configured — again, all on one screen. All in One SEO Pack has a more extensive list of social settings than Yoast. Each field has a full explanation, giving you the confidence to configure your website exactly to your liking. You can associate your website with an unlimited number of social profiles, plus you can connect Facebook Open Graph and configure Twitter Cards. Yoast SEO offers built-in XML Sitemap functionality. Enable XML Sitemaps by navigating to SEO > XML Sitemap and ticking the checkbox. With the Sitemap functionality activated, Yoast SEO notifies the search engines every time you publish new content. This makes it the quickest way to get new posts indexed. Your images are also indexed, meaning you can show up in Google Image searches, too. For greater control, Yoast SEO lets you exclude certain post types and taxonomies. You can also choose to exclude individual posts by entering the relevant post IDs. All in One SEO Pack supports XML Sitemap functionality — this module needs activating from the Feature Manager screen, too. Again, this will result in a new menu item: XML Sitemaps. Once activated, All in One SEO Pack creates your XML Sitemap automatically. However, there are plenty of settings for you to tweak. You can select which search engines are notified of sitemap updates, or you can specify a notification frequency. You also have full control over which post types and taxonomies make the sitemap — or, specifically, which are excluded. You also get to configure the Priorities and Frequencies for your homepage, posts and taxonomies. Yoast SEO Premium does offer access to the highly qualified support team, with more than half of all queries resolved within 30 minutes. Redirects — a quick-and-easy way to fix 404 errors. Multiple Focus Keywords — the free plugin only supports one focus keyword. It also includes 13 video tutorials, helping you to get the most from both the premium and free plugins. Video SEO (69$)— get your videos to the top of Google. Local SEO (69$) — improve your business’s discoverability in local searches. News SEO (69$) — ensure your website is Google News optimized. WooCommerce SEO (69$) — get SEO functionality for eCommerce stores. A bundle, including Yoast SEO Premium and all four extensions, is available for $279 (savings of more than $50). This price will grant usage on an unlimited number of websites. Compare this with Yoast, which costs $69 for single use — all the way up to $799 for 100 sites. control of the No Index and No Follow meta tags for individual posts/pages. Support is also available to premium plugin customer (this comes as an additional subscription: $10 a month, $35 biannually, or $49 annually). As you can see when it comes to choose a winner, it is a very difficult decision indeed. Both plugins are excellent tools, and either of them will undoubtedly work well. The decision which one to choose is, as usual, all yours, and it depends what you in search for. And don’t forget that you can use not one, but both plugins. Thousands of people use both Yoast and All-In-One Pack on different websites and have great results. May be this will work for you too. In case you do need help with your decision, or have any questions regarding SEO plugins or SEO in general, please contact us at datatechnologyllc.com. Our SEO company, Kash Data Consulting LLC, is specializing in providing top ranked SEO services at competitive rates in Plano, Frisco, Allen, and surrounding DFW Metroplex areas.